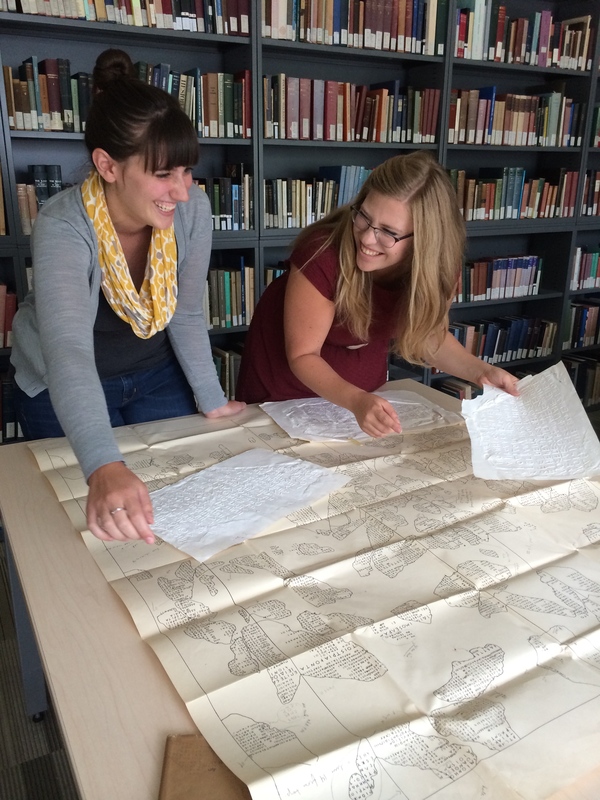 Haley (left) and Heather (right) compare a squeeze to the epigraphic chart. If you are passionate about Classics and the ancient world in Vancouver, British Columbia, you might find yourself at the University of British Columbia once a month attending a lecture hosted by the local branch of the Archaeological Institute of America (AIA). This week, From Stone to Screen had the amazing opportunity to present at one of these public lectures. This was unprecedented – no graduate student had spoken at a Vancouver AIA talk in over six years. Two of our own, Haley Bertram and Heather Odell, were asked to present on the project and its goals. And so, after weeks of preparing, they found themselves at the front of a classroom in Buchanan building presenting the project to the Vancouver community for the first time. The room was full; whether or not that relieved any of the pressure is difficult to say. We were excited to see that that so many people not directly involved with the department were interested in the project— something we hadn’t been able to gauge before—but this also meant that Haley and Heather also had a bigger audience than they expected to speak in front of. For someone who fears public speaking, having a packed room can be almost terrifying. These two budding academics, though, kept it cool and pulled strength from each other. “It’s like having a built-in person who has to listen to your ideas,” Haley joked. Haley (left) and Heather (right) joke while working on the lecture. While the two agreed that it may have been less efficient to work with another person, having the support and sharing the workload made the entire process easier. They split the workload evenly between themselves and also decided to hand off different sections to one another during the talk. 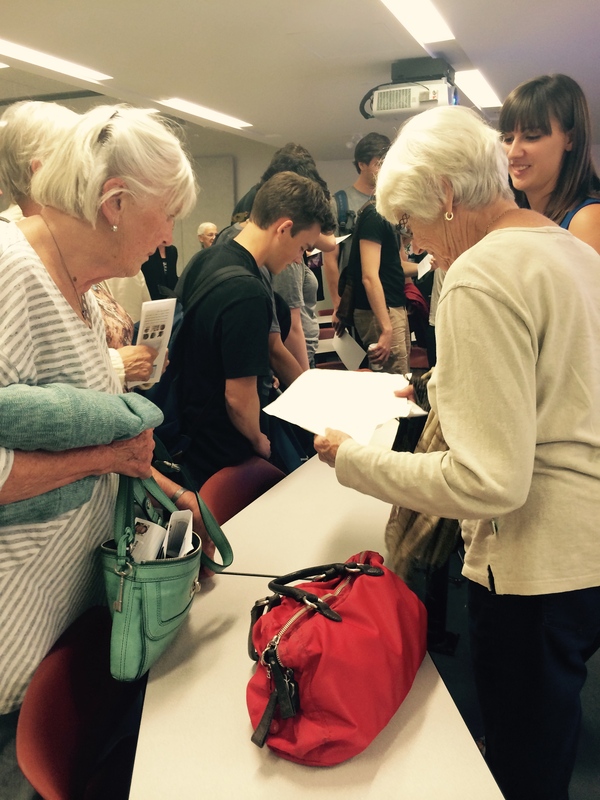 Ultimately, they appreciated that the audience was composed of members of the public. Until now, while From Stone to Screen has had several opportunities to write about the project, the presentation opportunities have been limited to department seminars, undergraduate classes and the UBC CNERS Graduate Conference this past May. Haley and Heather were approached by several people in the audience after the talk who were interested in the new digitization methods and who wanted to speak about the uses for the new databases. Having the feedback made all of the stress worth it in the end. 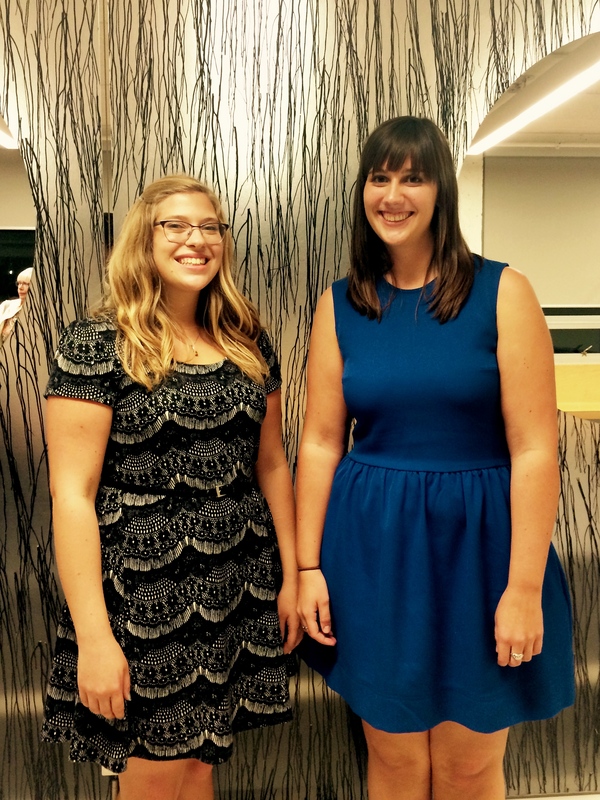 Heather Odell (left) and Haley Bertram (right) triumphant after their AIA talk last Tuesday. Despite the fact that they have both presented on From Stone to Screen before, Haley and Heather wanted to expand on the previous talks. The work with Digital Initiatives this summer has catapulted the project forward significantly and they had a score of new images and techniques that they were able to share. Working on a lecture that had already been presented several times, though, was more difficult than they had anticipated, especially since the first full-length version of it had been written by several of the graduate students involved in the project last year. Writing this lecture, though, gave them the opportunity to gain new appreciation for the project and what it can do not only for the CNRS department but also others in the field. Haley equated it to forgetting the thrill of finding artifacts on your first ever dig. “You forget how super exciting that is… It’s cool to everyone else who hasn’t encountered it,” she mused, “you’ve just acclimated to it.” Heather, who has worked on the project since its inception, agreed. Talking to the audience members gave it new light again. “You get a chance to step back and remember that what you’re doing is cool,” she added. When I asked them if they felt the pressure of speaking to members of the public instead of members of the CNRS department, Heather said that it wasn’t so much the pressure to speak in front of strangers but the new information they needed to discuss. So much has happened since the last talk in May that a large amount of it was still unfamiliar to them. For the first time, the theme changed from ‘this is what we’re planning to do’ to ‘this is what we have done.’ Haley, on the other hand, was more concerned with the pressure of speaking at the AIA. “Generally the people presenting are very respected in the field, they’re visiting scholars,” she explained. The project is a collective work which helped, but there was still the pressure of presenting graduate-level work. Members of the audience talk with the speakers about the squeezes following the talk. In the end, the talk ran a little over forty-five minutes (a relief to them both since they tend to speak rather quickly) and was hiccup-free. 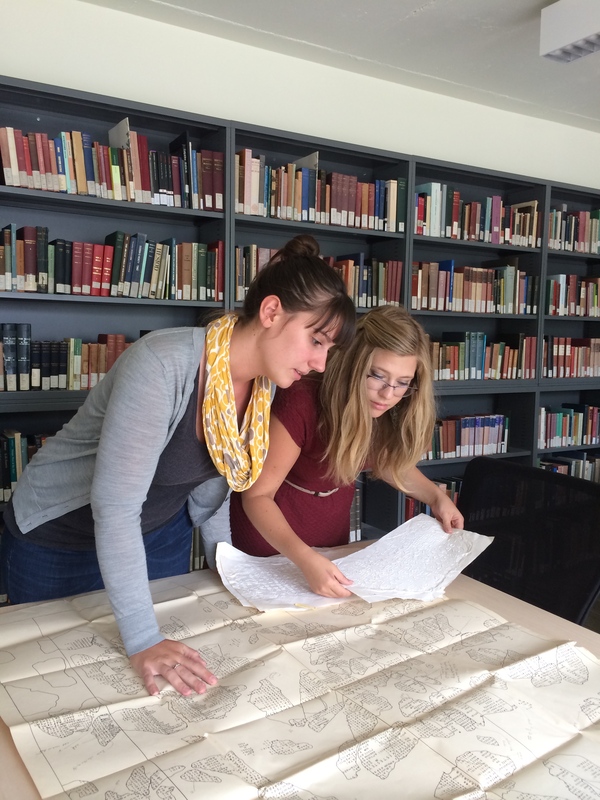 Haley spoke about the background of the Athenian Tribute Lists and their importance to scholarship. The high resolution images of our squeezes are allowing us to see details to the inscriptions that have never been seen before, and the timing of this with the reassembling of the original stone lists is perfect. Ultimately our project wants to allow anyone to see copies of the inscriptions without needing to be in their physical presence, and having the information readily available to the public in an online database will help anyone wishing to work on the lists. This is especially helpful since, by the very nature of how a squeeze is made, you have to read them backwards which adds more work to working on them. 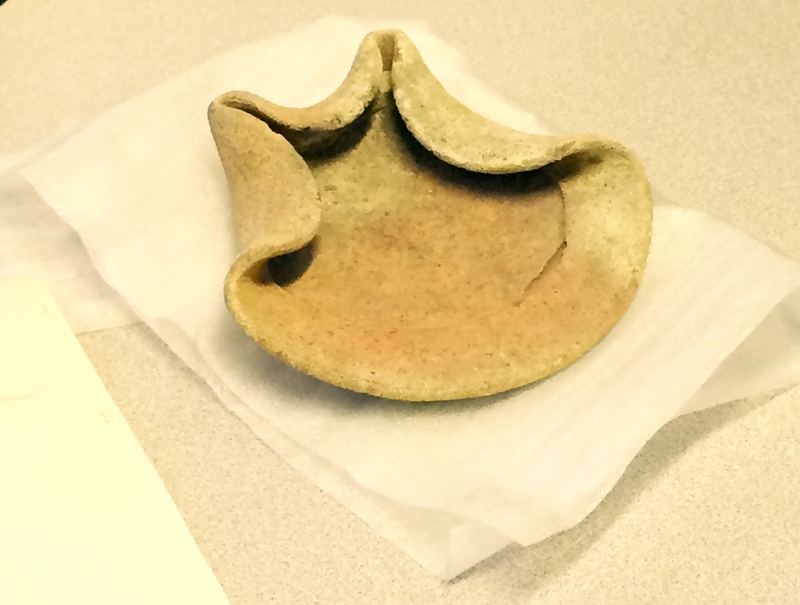 Some of the artifacts from the Fuller collection were brought out for the audience to see, such as this Phoenician lamp. In the end they were incredibly proud that the first talk of the season was on UBC work. That and the interest at the end made them very proud of their talk – all of the feedback at the end reiterated that one of the project’s main goals, that is helping the public gain access to the artifact collection and the information on the squeezes, is something that is wanted. The audience was enthusiastic about the information that can be gleaned from the squeezes and were even more thrilled at the chance to study the samples that Heather and Haley had brought with them to the talk. Since our presentation to the Vancouver branch of the AIA, we have learned that our poster submission to the 2015 Annual Meeting has been accepted. We are very excited to continue our AIA experience in New Orleans! Can social media make a difference?